Hello, friends - it's time to PANIC about the final season of Game of Thrones! This week, after more than a calendar year of agonized waiting, Entertainment Weekly finally unveiled a first look at the end. Not only did we manage a glimpse at the opening moments of the season, but we also got a bit of insight into the show's epic final battle. This, of course, is referring to the battle we heard murmurs of in Spring 2018. As it turns out, though, we only really got half the story. 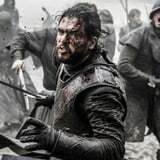 Back in April, rumor had it that Game of Thrones had wrapped filming on its biggest battle sequence to date. In case there's any confusion, it's the moment the armies of Westeros unite - we're talking multiple kingdoms coming together for one unified battlefront - and clash with the Army of the Dead. And yes, this whole ordeal is even bigger than the gargantuan "Battle of the Bastards" in season six. According to an official thank-you note, the cast and crew spent 55 days shooting the sequence, totaling almost two months. That's already pretty much unheard of, especially in the TV world.